The death of Dr. Bernard Nathanson today affords us an opportunity to recall the tremendous effect of Baptism. Like, our not needing to pray for any mercy to be shown to Nathanson for his 75,000 abortions. 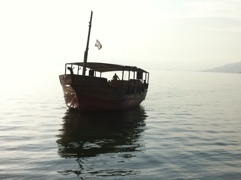 Day 4: Boat Ride, Capernaum … to Jerusalem! Off to a good start! Today we will have TWO videos since there was just too much to fit into 10 minutes (YouTube limits). 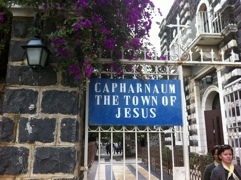 So, below is Part I and soon I will upload the afternoon and trip to Jerusalem in Part II. 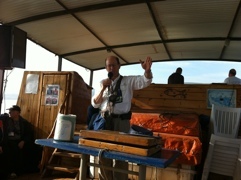 We spent the morning around the Sea of Galilee, on a boat ride, Mass at Capernaun and my talk “Defending the Eucharist”, the Multiplication of Loaves, the Primacy of Peter on the shore of Galilee and renewal of Baptismal vows in the Jordan River. 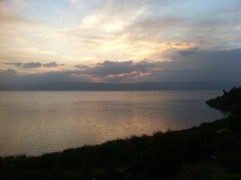 After that we drove through the Jordan Valley to Jerusalem for dinner, reflections and bed. We stopped for ice cream along the way. I gave my conversion story on both buses and the priests gave their vocation stories. Tomorrow the whole day in Bethlehem ending with a Palestinian meal of stuffed lamb, good wine and dancing.